The English Toy Spaniel, also known as the King Charles Spaniel, originated in Asia. After the breed’s ancestors moved to Europe, they found a home with their namesake, King Charles II of England. He began a trend of raising these sweet and loyal dogs, continued by Queen Victoria, Queen Elizabeth II, and countless other happy English Toy Spaniel owners around the globe for years to come. Spaniels are a type of gun dog, bred for flushing game like birds and small animals out of bushes for their owners to hunt. Despite their active history, the English Toy Spaniel has more often served as a lap dog rather than a hunting dog. That said, they still retain the playful spark that spurs them to chase after a darting chipmunk or floating butterfly. Due to their flightiness, they should be kept on a leash or in a fenced yard for play, and sleep inside the home with their family after playtime is finished. The most distinct characteristic of the English Toy Spaniel is its short, flat face. It has a domed head, large eyes, and long ears with fringed fur that matches its lovely coat. It also has sweetly chubby cheeks. 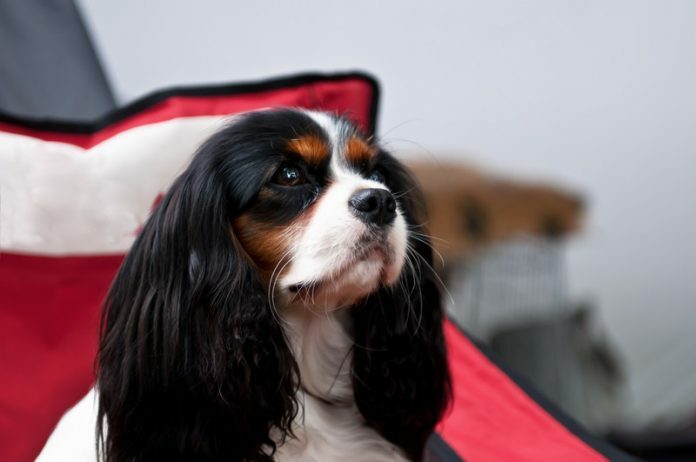 They weigh approximately 8 to 14 pounds and stand 9 to 11 inches high, smaller than their cousins the Cavalier Spaniels. English Toy Spaniels prefer the company of a comfortable and trusted few rather than a big gathering of loud people, and they also are easily overwhelmed by small children. They may become shy or skittish around new people or animals, which should be managed by introducing them to different social groups often. Their docile and easy temperament makes them a perfect companion for aging adults. Their small size also makes them perfect for small homes or apartments. English Toy Spaniels, however, do not do well when left alone for a long time. Therefore, they would do best in homes where someone is home the entire day, as in a couple where one person works from home or if one or both are retired. Although the English Toy Spaniel can be stubborn at times, they are willing to listen and learn. Additionally, training your English Toy Spaniel will become easier over time as you both establish trust and communication between each other and you come to understand your dog’s style of learning. Behavioral scientists have proven that positive reinforcement techniques work better than force or harsh words for all dog breeds. The English Toy Spaniel, always hungry for affection, will respond almost magnetically to a smile or encouraging words during training. Treats will also help any training exercise. This breed needs light exercise, and will do best with people who are home often to keep them company. Its moderate need for exercise may come from the fact that this dog will follow its owner around the house, interested in whatever you do! The coat of a typical English Toy Spaniel is long, silky, and feathery at the ends. Its colorings are so distinct that they are even named. Blenheim describes a red and white coat, and King Charles is a black and tan coat. Prince Charles is a white, black, and tan coat; while Ruby is a solid red coat. Their coat needs regular and frequent grooming to upkeep your dog’s health, but the happiness it brings to your dog to maintain its beautiful coat will be well worth the effort. Owners must be cognizant that this breed sheds often and impressively, and their distinct coats may end up covering your home and clothes. If you want a dog that doesn’t shed, then this isn’t the breed for you. Its flat face, introduced to the lines from interbreeding with pugs before the 20th century, makes the English Toy Spaniel incredibly sensitive to heat exhaustion. Therefore, this dog must not be left outside for long and should be monitored with a strict eye for signs of fatigue, especially when outside in hot and humid weather. Additionally, due to their narrow windpipes, they are also at risk of heat stroke. Due to their large eyes, they are also susceptible to scratches and other eye problems. They are also slightly more likely than other breeds to develop heart problems, as well as often being sensitive to anesthesia. The average English Toy Spaniel lifespan is about 10 to 12 years. The English Toy Spaniel is a perfect companion for a quiet home, and bringing one into your family will be the start of a wonderful chapter in your life. Ensure that you are sourcing your dog from a reputable breeder or adopting from a rescue to minimize health conditions that could appear early in your dog’s life, and you will have a loving and doting little companion for many years.